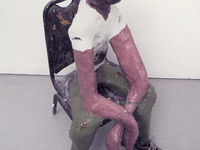 The theatricality of Ryman’s sculptures (constructed of papier-mâché, PVC piping and acrylic paint, the figures take on puppet-like personas) is no accident. Ryman, who spent ten years as a playwright, brings narrative and drama to his sculptural tableaus. Very much like actors in stage sets, or characters in plays, Ryman’s figures are caught, as if forever, in sympathetic and vulnerable moments. In Ryman’s “Untitled #14,” a pouting anthropoid, as if tall with dejection, takes a moment to contemplate life, and the floor. Ryman’s theatricality is saccharine in its empathy; the situations that his minions endure are as absurd as they are tragic. Our contemporary plight is all too silly, and all too real. One often hears the “art imitates life,” formulation, and, perhaps equally often, one hears the converse, that “life imitates art.” Certainly, this contemporary moment, creatively, is fostered as much by farce as by experience. On the one hand, it has become unsatisfying to say that art is a purely reflective of experience, when it seem quite evident that art functions as far more than a mirror—whether we’re talking about a Hollywood movie or a hyper-text poem. On the other hand, the notion that we are solely the function of pop culture is equally reductive. Like theater, the process of living, and art, is rife with expectation and easy assumptions. By directly engaging the sentiment, the ready-made emotion, Ryman addresses not only the superficiality, but the underlying identity of the human façade. Ryman demonstrates a total control of his material and subject matter in this rigorous performance. Capitalizing on his theatrical and directorial expertise, Ryman has produced a lush and stinging moment of sculptural theater.